Taking the time to study and celebrate Thanksgiving in an elementary classroom is a great way to create an environment of thankfulness. When students are lead to practice gratitude it can help to build a mindful classroom. However, being thankful does not come easy for all. Whenever I ask my students to brainstorm what they are thankful for, I inevidably get the same three things:my family, my home, food. Let's be clear, there is absolutely nothing wrong with these three. Those are absolutely things that we can, and should, be thankful for. But I think it can go deeper. Thankfulness can be more than the 'big three'. It can extend to specific characteristics, qualities, people and the 'little things' in life. In every season there is always something to be thankful for. I have taught in both high and low-income schools, and the practice of showing gratitude is not limited to any particular socioeconomic status. This year, my grade three students were particularly thankful for their Grade Eight Buddies. I teach in a K-12 school. My class is both 'big' buddy to a class of Grade One students, and 'little' buddy for a class of Grade Eight students. Their Grade Eight buddies visit them every second Friday during math, and it is just so welcomed. Each of my littles gets one-on-one time with someone who can help to coach and encourage them through tricky concepts. It's also a great way to build multi-age friendships in such a diverse campus. In an already jam-packed curriculum, there is hardly any time for seasonal unit study... but I feel like a focus on thanksgiving is just so important. I make sure that it integrates with my Language Arts outcomes so my students are still meeting provincial standards while also taking time to develop their character. 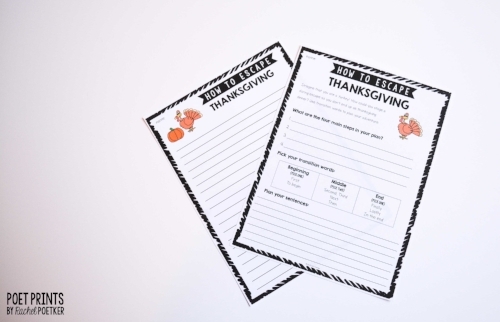 How do you celebrate Thanksgiving in your classroom? Have you ever practiced showing gratitude to another grade, or teacher in your school? Let me know in the comments below!